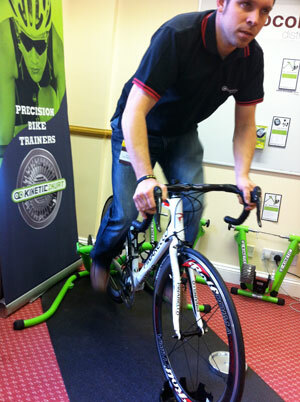 Core Bike; it ought to be called Cor! Bike. It’s a show held every year around this time in a corporate hotel next to Silverstone race track so that specialist bike shops can see, touch and order all the blingiest kit for the new season. Of course, a lot of the shiny product has been launched and extensively covered at Eurobike in the preceding Autumn but there’s something about the proximity of the impending busy time and excitement at some riding weather – don’t forget these shops are mostly manned by bike fanatics – that makes Core Bike the official start of the cycling season. The 2011 version was held last weekend and the talk was less about decline and recession as how to find good staff and whether all the best bikes would be sold out again by June. What should have been a hot topic of gossip – the setting up of a website called www.antichainreaction.com by a group of Spanish bike shop owners disgruntled by the interest of their customers in the new wave of British mailorder retailers – was treated mostly with a shrug. These are shops that have got used to what CRC and Wiggle have to throw at them and come out the other side fighting. “Or die trying,” as one shop owner put it with a wry smile. It’s a show more about accessories and clothing – the big bike brands tend to do their own new-season shows pre-Christmas – but there were small specialists represented, not least De Rosa which has made a serious impression since raising their game in the UK. Of course, there was the gorgeous £2,700 R838 which was our Cycling Weekly 2010 Bike of the Year but squeezed budgets are frankly getting us interested in more bike for less money and the new Milanino model caught the eye after first seeing it at a distance among the yachts at the London Bike Show a few weeks ago. 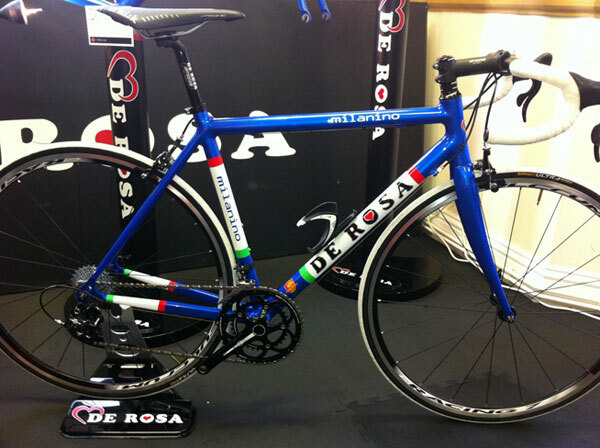 Based on an exquisitely finished, multi-butted aluminium frame, full Campagnolo Veloce transmission, Fulcrum Racing 7 wheels as well as FSA finishing kit and even complete with Look pedals, it struck us as a proper Italian beauty at £1,600. 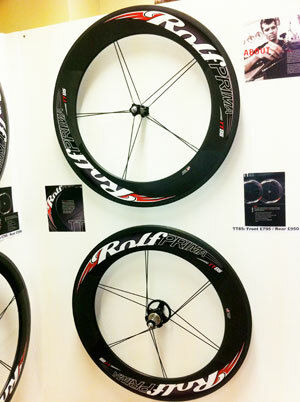 The originators of the minimalist-paired-spokes concept, Rolf had something up their sleeves; showing for the first time anywhere their new carbon TT85 wheels. With 10 Sapim CX spokes at the front and 12 at the rear, these are clearly aimed at time triallists and triathletes although the TDF85 variant with 12 spokes at the front to satisfy UCI regs will work for aero road racers, too. 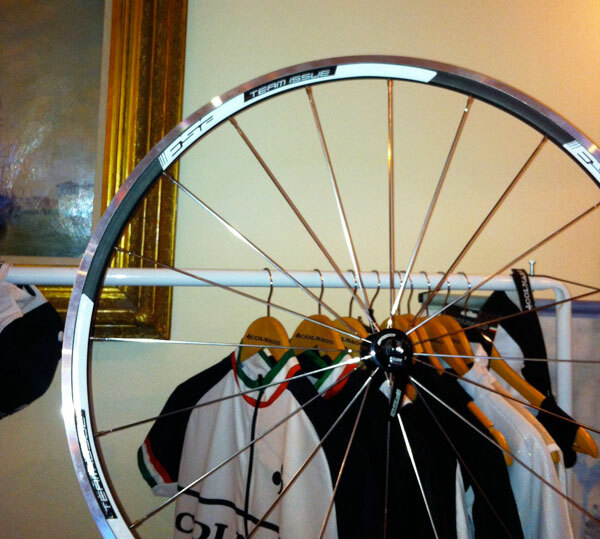 The superb hubs are made for Rolf by White Industries, which was also news to us. Price for the front is £795, rear for £950 and there are freehub bodies for Campagnolo or Shimano/SRAM drive. Weight is 1,685 grams, for tubulars only. While the engineering firm Hope was showing new bits of the kit they’re really famous for – a machined DH crankset and chainguide got us wondering whether we might eventually see such a thing for road bikes – their man Ashton Payne showed us something that’s more or less ready to go in the lighting area where they’re building a strong parallel reputation. The new 8-LED front light, “aiming to be the most sophisticated light on the market,” according to Payne, its designer, has such a potentially complicated combination of spot, flood and ellipsoidal beams that the top-mounted LCD display is designed to simplify the functions so that a large single and positive rubber button is all you need to think about while you’re navigating fast through tree-infested singletrack. 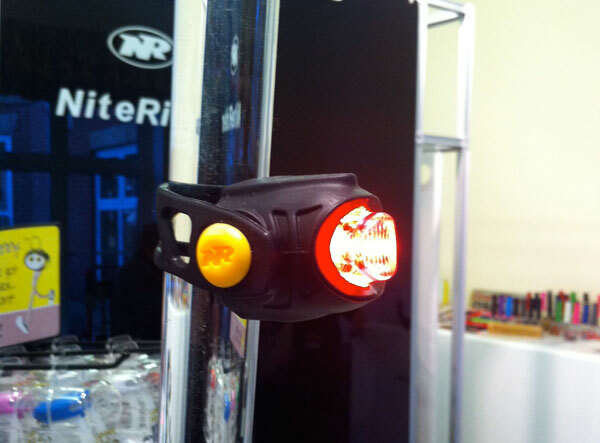 With a maximum ‘boost’ level of 2,500 lumens – so powerful there’s an automatic throttle back to a ‘mere’ 1,500lm after three minutes for a 2.5 hour run time with the current battery, it’s safe to say that moths and bats will be fried in mid-air but Payne is keen to point out that it’s mainly all about the choice of beam patterns. To mount it, Hope will be using the new fitting already so popular on the latest rear light and that in turn will either fit directly to the front clamp of a Hope stem or via a bracket to standard handlebars. Price when it ships in August, ready for the next lighting-up season, is likely to be £450. Italian clothing company De Marchi on the one hand charges ahead making kit that increasingly makes us look like science fiction extras and for which we’d better have a fit-looking body. Luckily for most of us, though, they’re also looking back into their old catalogues, seeking inspiration for cyclists who like natural fabrics and a more flattering fit if you’re a bit cuddlier. 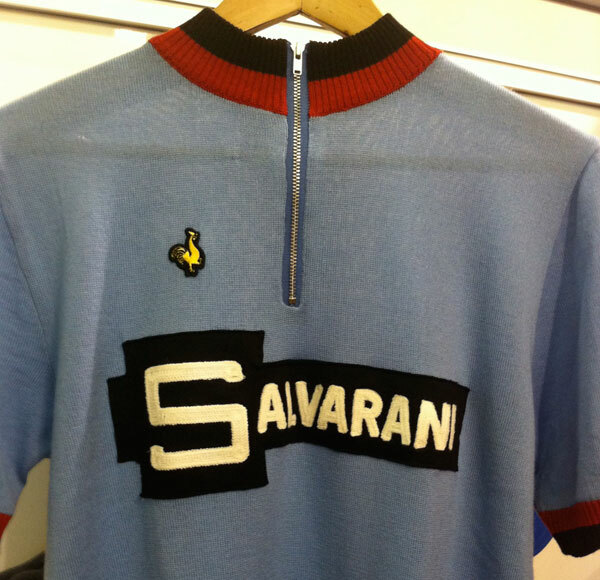 Our favourite from their World Champions range for this summer is the 100% Merino Wool Salvarani jersey, as worn by (according to our big book) Marino Basso when he beat Franco Bitossi and Cyrille Guimard at the 1972 World’s. Price £120. 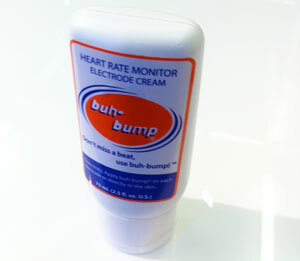 What shall we call this heart rate strap conductivity cream? Having briefly considered HRSCC (probably) the makers of this 75ml tube of gunk opted instead for ‘buh-bump’ an onomatopoeic name for a simple product designed to speed up that awkward stage when you’re trying to get your HRM strap to work on dry skin. Cycling Weekly readers will be familiar with the Dutch brand BBB from its sponsorship of the Quick Step and Vacansoleil pro teams in the form of helmets and glasses. 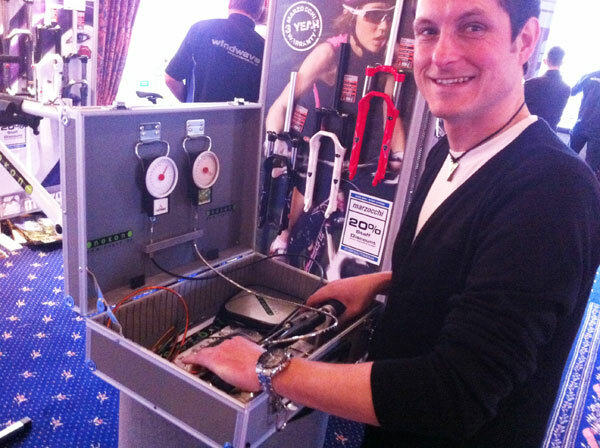 Back in its native Netherlands, the huge range of BBB pumps, locks, clothing, seatpacks, computers, tools and lights is widely seen in bike shops and the newly appointed UK distributor Windwave is tasked with making that the case here, too. We liked the look of the high-quality hinged frame of the Impulse glasses that come complete with extra clear and yellow interchangeable lenses in addition to smoke grey for £69.99. There’s also a set with a photochromic lens that changes colour according to the prevailing light for £99.99. We’ve never been sure about CO2 cartridges for roadside puncture repairs but they have their fans for sure. 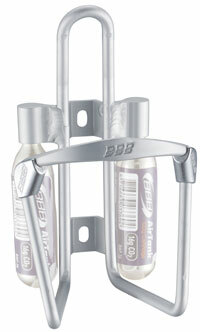 The BBB CO2 Tank – an alloy bottle cage with threaded bosses for two cartridges at £7.99 seems like a clever solution. 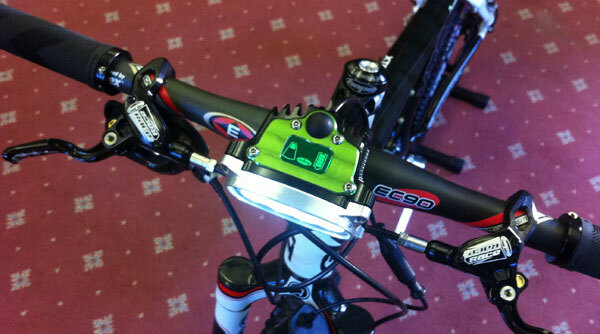 There’s also a cheaper, simpler version called CO2 Hold that fits under an existing bottle cage. The Kinetic range of home trainers, especially the later ‘Road Machine’ with an upgraded resistance unit containing a silicon fluid which doesn’t become thinner and less resistant as it heats, has been well reviewed in the pages of Cycling Weekly. That model at 299.99 is still very much available but the even newer enhancement just hitting the shops features the same resistance module but mounted in a new, wider chassis that allows the bicycle to rock through a range of twenty degrees either way, to more accurately simulate the motion of riding a bike. 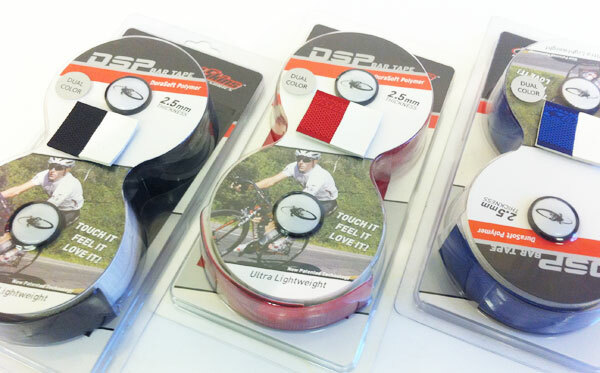 The American handlebar covering specialists Lizard Skins have introduced a 2.5mm version of their well received DSP ‘bar tape that provides a smidge more texture and a little extra (well, 0.7mm more) padding for people who want greater comfort on their road bars. Furthermore, there are dual-colour versions that allow black on the drops and white at the top, or blue on the top and white on the drops and….you get the idea. An extremely competitive 1,400 grams is claimed for the new Team Issue road wheels from Full Speed Ahead and the price isn’t bad at £699.99. The rims are based on an alloy extrusion with a carbon wrap for the best-of-both-worlds, in theory. We’ll see but FSA do seem to enjoy a reputation for doing their testing and keeping an eye on the build quality. There’s a much larger German company that specialises in cables of all kinds that’s behind the Nokon brand and although he’s Italian and in marketing, its Gianni Silverii has obviously picked up a few tips from the guys in white lab coats because his engineering arguments are flawless. Nokon cables were already 40% or so lighter than standard Bowden cable by employing the unique and ingenious Konkavex segmented alloy outer. The next mental leap was to ask why the new cable had to be the same diameter as before and the answer, of course, is that it doesn’t. The new smaller diameter cables now save a whopping 58% over standard cable sets and, as Silverii was able to demonstrate with his portable stress-o-meter, the new cables actually apply more force at the brake than a standard cable, too. Anodized outer colours available are silver, black, green, red and orange and the price for a complete brake and gear set is £79.95.